Watching the Hyundai pull into the parking spot, I cringe a bit with the stress that strikes when I feel like I’m holding other people up. The car is wiggling backward and forward, backward and forward, trying to fit into the dead center of the spot, and another driver is stuck, waiting to get by in the tight garage. Once the Hyundai is finally parked, the waiting driver pulls up and stops, window down and eyes wide open. And she’s not annoyed. The car in question is the Nexo, Hyundai’s newest midsize SUV, with room for five and a week’s worth of groceries. And while the self-parking capability is its most noticeable, maybe marquee, feature, that’s not what makes the Nexo interesting, nor does it explain the blood-draining $58,300 base price. Nor do the heated and cooled seats, the vegan-friendly faux leather materials, or the 12.3-inch, high-res touchscreen. To find the answer, you’ve got to pop open the hood. The Nexo is all-electric, but it’s no Tesla look-alike, pulling power from a hulking battery built into the floor. This SUV makes its own juice with the hydrogen fuel cell sitting where you usually find a gas-exploding internal combustion engine. Like the few other hydrogen-powered, zero-emission cars on the market today, the Nexo is a joy to drive. As long as you can live with the fact that what makes it special also happens to make it a pain. The promise of hydrogen power has tempted the auto industry for more than half a century. The idea is simple. Instead of storing electricity in a battery, you make it as you go. In a fuel cell, hydrogen (stored as compressed gas) is stripped of its electrons, then combined with oxygen. The resulting electricity powers a motor (and in turn the wheels), and water, the only byproduct, drips out a tail pipe. When you run low on hydrogen, just swing by a pump. After five minutes or so, you’re back on the road with a full tank that should be good for more than 300 miles. It’s a terrifically clean process that offers the benefits of EVs—a clean conscience and zippy acceleration—without the need to plug in for hours to recharge a drained battery. The tech has been hyped since General Motors showed off a fuel-cell-powered prototype van in 1966. The Nexo’s 12.3-inch touchscreen works nicely and makes it easy to look up the nearest hydrogen fueling station. Today, though, the Nexo is one of just three fuel-cell cars you can take home in the US, along with the Toyota Mirai and Honda Clarity. GM and the German automakers who poured R&D money into the technology have stopped bringing it up, instead pushing their battery-based electric offerings. That’s because this scheme has plenty of downsides. There’s hardly any infrastructure to move the fuel around the country. Hydrogen is the most common element in the universe, but the process of making it useable as fuel often involves natural gas, so it’s not a guaranteed clean. No surprise, then, there aren’t many places to fill up. The Department of Energy lists fewer than 40 public hydrogen fueling stations in the whole country. Every one is in California, mostly around Los Angeles, with a few in the San Francisco Bay Area. For reference, the Golden State has more than 15,000 EV charging spots and 10,000 gas stations. The good thing, I discovered during the 10 days I spent with the Nexo, is that when a full tank takes you about 325 miles, you don’t need to refuel too often. But after a week of shuttling between home in Berkeley, work in San Francisco, and meetings in Silicon Valley, I found myself in Mountain View with 40 miles left in the tank. Not quite enough to get home. Happily, Hyundai anticipated newbies like me and programmed the Nexo’s inbuilt navigation system to pull up to the nearest hydrogen oasis. And lo, there was one in Palo Alto, just a few miles away. A few miles out of my way—a strange feeling to pass up so many gas stations—but acceptable. That’s when things got tricky. The hydrogen fueler at the Barron Park Shell station on El Camino Real looks like a regular gas setup, down to the credit card reader and pump handle attached to a long black hose. I popped open the Nexo’s fuel door and followed the posted instructions: insert credit card, pick up pump, select pressure rate, begin fueling. Simple enough, except that it didn’t work—no hydrogen. I tried again, and a third time, only to get more error messages. Then the station attendant came over and explained the actual process: insert credit card, pick up pump, lock the nozzle onto the receptacle, pull the handle to lock it on, then select pressure rate. Getting it off again took a fair bit of jimmying. The attendant at one point borrowed my keys to knock away some of the ice that formed on the nozzle. (To ease fueling, the hydrogen in the pump is kept at –40 degrees Fahrenheit.) The delay gave us a chance to chat, though: He loves having the pump at the station and says it has several visitors a day. 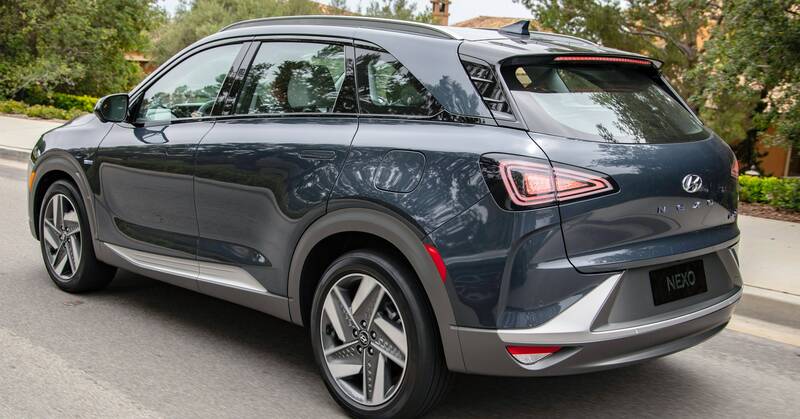 Hyundai filled the Nexo with all sorts of neat features, including a camera view of the car’s blind spots that pops up in the dashboard when the turn signal is on. I understand his happiness when I realize that a not-quite-full tank cost me $85. Let’s compare that to the similarly sized Lexus RX, which gets 27 mpg. For 350 miles of range, you’ll need 12.96 gallons of gas. Premium gas in California right now averages $3.544 a gallon, so you’re paying $45.94, barely half what I paid for my high-pressure gas. But worry not, Hyundai’s so eager to get you into this car, your lease comes with three years of free fuel (up to $13,000). And on that note, the government will ease the $58,300 price tag with a $7,500 tax credit from the feds and an additional $5,000 from California. Add those up (assuming you drive enough to hit the fuel max), and you can knock the car’s price down to $33,300. That’s quite good for a car stuffed with luxury options. A couple of minor gripes: The whole center console is covered in buttons, more than 30 of the things. Buttons trump touchscreens because you can hit them without looking away from the road, but when the cockpit feels like a B-52 bomber, they lose that advantage. Better design can shrink that number by combining functions in logical ways. And driving-wise, I’d have liked the option of dialing up the regenerative braking further, so the car recaptures more energy from the wheels as it slows car down. Crank that high enough, and you can stop the car just by getting off the accelerator. My bigger concerns are for the bigger idea of selling hydrogen-powered cars. I wonder whether Hyundai will sell enough to make back even some of the R&D it put in here—or if the execs will settle for meeting California’s requirement that they sell at least some zero emission cars in the state (the automaker also offers a few battery-electric models). And even if the network of fueling stations is growing, it will be a good while before it can match the reach of what’s likely its real competitor—the conventional electric car. Charging a Tesla or similar may take a bit (30 minutes for a nearly full battery is increasingly common), but the grid is ubiquitous, and installing a charging station anywhere you like is far easier than setting up a hydrogen pump and keeping it full of fuel. There’s an old joke about hydrogen: It’s the fuel of the future, and it always will be. But at the end of my test drive, I’m sorry to give up the Nexo. I’d just filled it, after all, and I was ready to get back on the road. Previous PostPrevious Più tasse per i ricchi: servono davvero?